Preheat dutch oven to 350 degrees for frying. Add onion and fry until it turns clear. Add all ingredients except kidney beans. Lower heat to 225 degrees. Let me know how you enjoyed your 2 hour Chili! 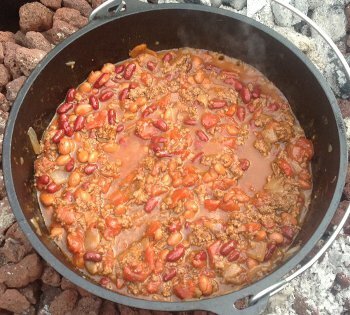 Made the 2hour chili in our fire pit and Dutch oven. Great!!! I have pictures. Let me know how to send them to you! @Terry - (and anyone else) - You can send recipe pictures to dutchoven at dutchovendude dot com and I'll try to get them added to the recipe page. Great Chili recipe. We brought a splatter cover with us to put on top of the dutch oven for the 1 hour simmer. That prevents bugs and leaves from getting in.